A month after the death of music legend Prince, the controversy over his estate continues to grow. In court papers filed Monday, two potential heirs to the singer’s fortune filed papers protesting the administrator of the estate’s plan to DNA test the possible relatives of the musician. An objection filed by Brianna Nelson, who claims to be Prince’s niece — and a minor identified only as V.N., who claims to be the musician’s great-niece, takes exception to the “complete and unfettered discretion” that Bremer National Trust would have in determining testing for those claiming to be relatives of the “Purple Rain” musician. Claimants will also have to fork over for the cost of their genetic testing. In papers filed in federal court in Minnesota last week, Brianna Nelson claims to be the daughter of Duane Nelson Sr., Prince’s reported bodyguard and half-brother. Duane Nelson Sr., who was not among a list of siblings and half-siblings filed by Prince’s sister Tyka Nelson following the singer’s death, shares the same father as the deceased singer. However, court papers note that Tyka did identify herself as Duane Nelson Sr.’s sister in a statement following his 2011 death. An affidavit was also filed last week by a woman, Jeannine Halloran, who claims to be the mother of a 11-year-old, who she claims is the daughter of Duane Nelson Jr. The minor is identified only as V.N. According to the papers, Duane Nelson Jr., who died in 2004, was the son of Duane Nelson Sr., which would thus make her Prince’s grand-niece. Papers filed by Prince’s sister Tyka Nelson indicate that the musician died without a will, though author and filmmaker Ian Halperin, who’s currently collaborating on a documentary about the final hours of Prince’s life, told TheWrap that the people he’s spoken to insist that there is a will. One theory holds that the document could be in Canada, where the singer had a home. Prince died on April 21, days after he reportedly was treated for an overdose of the opioid painkiller Percocet. He was found unresponsive in the elevator of his Paisley Park home in Minnesota, and responders were unable to revive him. The results of an April 22 autopsy are still pending. Bremer has secured a sample of the singer’s blood to test for possible parentage issues. The singer had no known living children at the time of his death. A black and white motorcycle jacket worn by Prince in "Purple Rain" will go up for auction June 29 via Profiles in History, with bidding opening between $6,000 and $8,000. The cone puppet used by Prince in his landmark film "Purple Rain" -- OK, one just like it at least, sold on the Purple Rain tour -- can be yours for a mere $1,495. Plus $14 shipping. A pair of bejeweled handcuffs worn by the Purple One onstage during the performance of "The Most Beautiful Girl in the World" fetched $12,500 at an auction held by Nate D. Sanders in March. At the same auction, a diamond and amethyst Love Symbol pin worn by Prince took in $12,500. Played at San Francisco's Cow Palace during the Purple Rain tour, this tambourine commanded $590 on eBay this week. 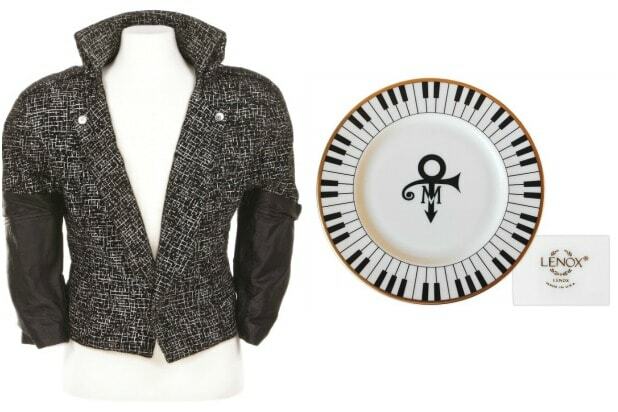 Also offered up at the Nate D. Sanders auction: A plate from Prince's wedding, which took in $1,875. Couldn't make it to Prince's final concert in Atlanta on April 14? This ticket stub from the show, as well as a CD that was given away after the gig will put you there -- kind of -- with a current bid of just under $800. A check written to Prince in 1977 that bears his endorsement signature went for $3,326 at the March auction -- even though the original check was only written out for $100. 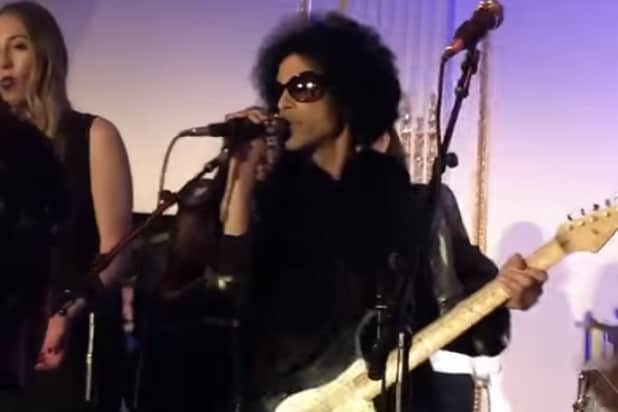 Prince is probably the only person in the world who could have pulled off wearing this scarf. But somebody paid $1,250 for it during the Sanders auction anyway.